At the turn of the 1970s, the expert community was actively discussing the “madman theory” attributed to US President Richard Nixon. Nixon believed that popularizing a conviction that the White House was the abode of a mad politician (himself), who hated the Communists so much that he was ready to use any means, including nuclear weapons, to crush them would be a powerful lever to put pressure on the disobedient North Vietnamese. He was confident that the Vietnamese would be scared and rush to the negotiating table to end the disgraceful Second Indochina War on Washington’s terms. Today, watching Washington threaten a good half of the countries in the world, experts are blowing the dust off old manuals and brushing up this “good old theory.” Practically all the states in the Western Hemisphere, Turkey, China and Russia are named among those affected by the ill-conceived US actions that violate the habitual norms of interstate relations as well as international law. But the main targets for the new version of the “madman theory” are North Korea and Iran. The reaction to Washington’s aggression against these two coming from its closest allies in Western Europe indicates that the leading West European states are hastily creating fool-proof systems to protect their legitimate political and economic interests from US pressure. It was America pulling out of the “nuclear deal” with Iran that proved the decisive factor influencing their decision to fend for themselves rather than bothering to waste any time rubbing shoulders with Washington and risking destroying everything. Another option is to do the same in an alliance with Russia that also regards the current US diplomatic practices as devastating. It is this that we see as the EU’s motive for expediting the development of the Special Purpose Vehicle (SPV) in September 2018 to handle anonymous settlements with Iran in circumvention of the US-controlled SWIFT system. Later Germany, France and Britain decided to establish the Instrument in Support of Trade Exchanges (INSTEX), with its headquarters in Paris, to take charge of settlements with Iran. But for the time being we should not overestimate the scale of confrontation between the US and its European allies. During the first stage, INSTEX will make possible European sales of food, medicines and medical equipment to Iran. The list of supplies might be extended in the future but it is still unclear how soon and what the items in question will be. But if Berlin together with its partners think better of expanding the range of traded commodities, this would mean that Donald Trump’s version of the “madman theory” proved more effective than its Nixonian original that didn’t help Washington in any way in the early 1970s. A much more radical collective actor are the 19 member states of the EU’s Economic and Monetary Union (EMU), which are doing their best to make the euro an independent pole of the world financial system. 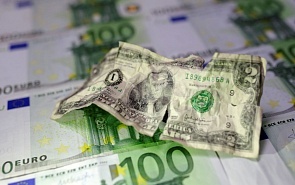 Why the euro and why now? Our reply is the following. First of all, the EU is enviously keeping an eye on how Russia is exchanging its dollar reserves for gold, renminbi and euros in fear of today’s most dreadful “black swan” called the “collapse of the US dollar.” The global financial markets have been expecting it for the last 40 years and know how to live with this threat. But America’s huge domestic debt and its double (trade and international payments) deficit are here to stay and there is no satisfactory solution to the problem. Expanding euro settlements will balance off the world finances and become an additional guarantee of stable development for the EU. Secondly, the euro’s more pronounced international role will result from the effort to solve some long overdue problems rooted in the 1992 Maastricht Treaty and its far from perfect EMU structure. Brussels is right in viewing the Monetary Union as its top achievement that transformed what was initially an amorphous trade union into a supranational organization capable of talking as an equal to other global players. With the euro plunged into a crisis or, still worse, going into a nosedive, the project to establish supranational agencies will have to be dismissed as a fairy-tale dream and the real European agenda will be filled with the usual intergovernmental routine of coordinating country positions and brokering a consensus. The European Commission’s plans to strengthen the role of the Euro in international trade have been driven by the recognition of structural dependence of Europe’s trade on the US economy, on the Dollar as a global transaction currency for key commodities — and of the massive extraterritorial effects US legislation and sanctions policies have on Europe because of that dependence. But even here the EU is extremely cautious lest it frightens Washington ahead of time. The European Commission explains its effort to internationalize the euro by the pragmatic desire to help the European monetary unit squeeze out the dollar as the payment instrument when it comes to oil and energy imports. Each year, the EU countries purchase 300 billion euros worth of energy but all the payments made are in dollars, as is the case since the mid-1970s. So, the current European disaffection is disguised as pragmatism: the Americans must not so much as suspect that Europe is bracing up to throw off the American yoke. Let me add in conclusion that the term “multipolarity,” formerly a taboo in Brussels but hailed by Russia as an ideal global political and economic system, is now highly popular with Eurocrats. Interestingly, it has come into prominence precisely during the debate on internationalizing the euro. Such a coincidence can surely not be accidental!